I have a question for you. If you were able to reach 100% of a base, versus just a fraction of the market with the same exact products, by just adding some new tools to help people buy those products, would you do it? Of course you would. 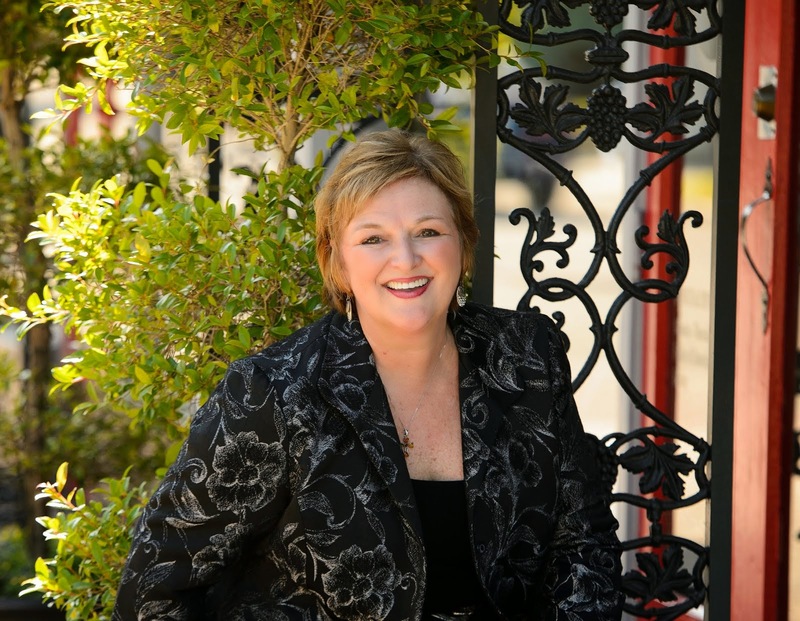 I have been the lone voice in the wilderness for nearly a decade on this topic for the travel industry, as the industry consistently markets to the minority traveler, the 16% of overnight travelers that fly to their destination. We do this by structuring online booking to focus on the destination - the place where travelers magically land and then book your product. Whether you are a hotel marketer, an online travel agency, a cruise line or a tour operator, I would challenge you to go right now and look at your online booking tools. If you are not asking where the person is starting their trip and what mode of transportation they are using, then you are by default marketing to the air traveler. If you are marketing to the business traveler, just 33% of all trips are by air and a whopping 67% is by car. 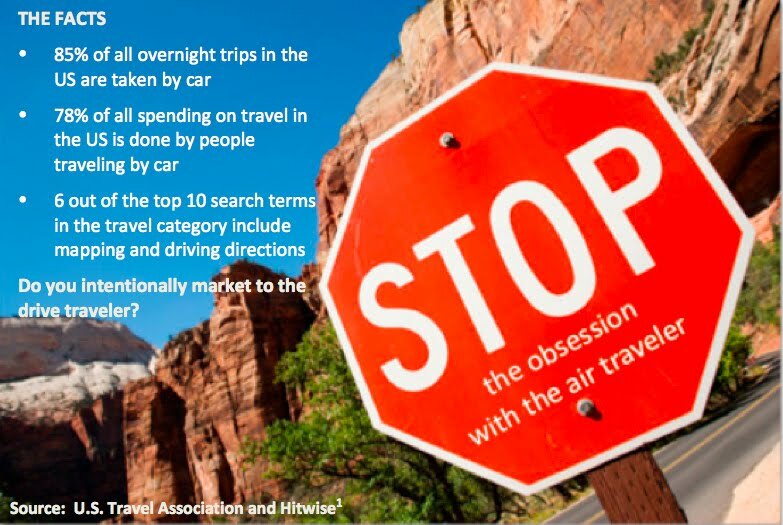 If you are a leisure marketer, an overwhelming 89% of overnight travelers are traveling by car and just 11% by air. 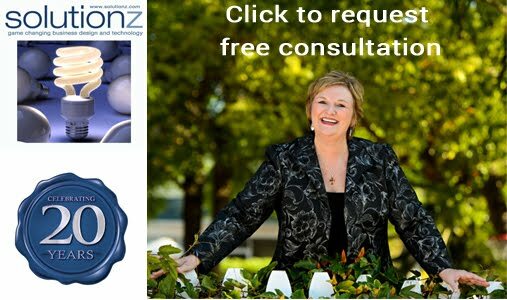 Click here to register and immediately download this free 7 page white paper on the drive market. Here are the forecasts for travel, as published by the US Travel Association through 2016. If you want to reach 100% of this market as your target, then you will need to wake up and change how you sell your products to this enormous market. 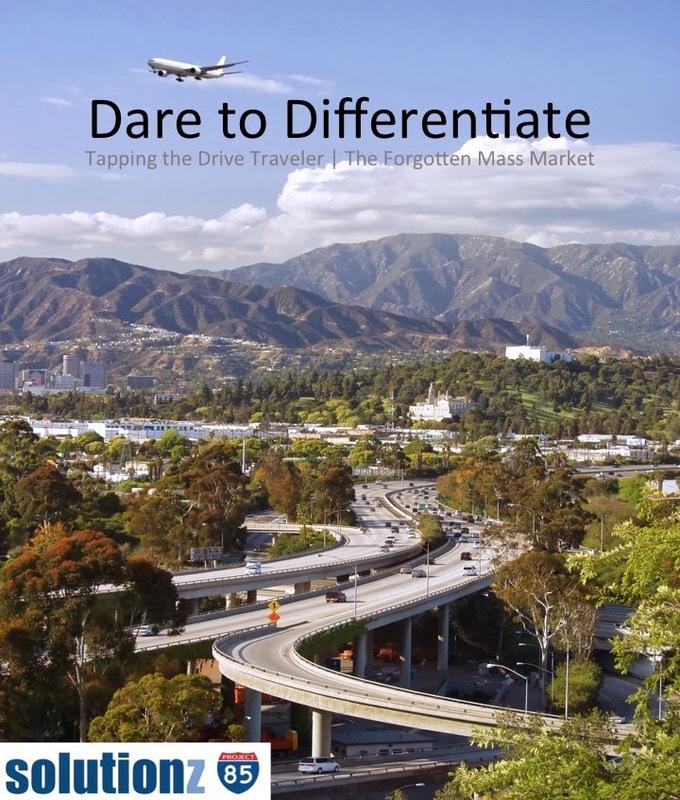 Dare to differentiate yourself and intentionally market to the drive traveler. If you would like the full white paper on the drive market, click the image to the right. Once you register, you will be able to immediately download this informative 58-page white paper on tapping into the drive traveler - the forgotten mass market.